Murphy's sister Nancy is a wonderful singer and songwriter. 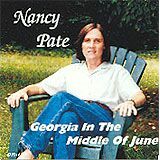 This CD features her original songs, all acoustic, with Murphy on banjo and mandolin and Casey on bass and banjo. Nancy does a great job of singing Murphy's own M&M Blues. Harmony singing by Murphy's sisters Laurie and Argen. Gentle bluegrass.